Our competitive pricing, schedule successful on-time completion record and overall customer satisfaction rate will convince you that we are the only choice for your complete concrete surface preparation, concrete polishing, and concrete coating needs. Dynaguard is the difference between coating failure and the proper mechanical bonding necessary for a long lasting, waterproof, and durable coating that reaches it’s warranted life. Our crews have the knowledge and experience to complete demo and prep to finished concrete polishing, overlays, coatings, and more. Every employee is consistently trained in the latest processes, technologies, and safety procedures to ensure the we meet our clients goals and beyond in a safe, efficient manner. We are a proud Diamatic “Elite” installer. Diamatic is the leading manufacture of concrete polishing, machines, tooling, and treatments in this ever growing polishing industry and to meet the requirements as one of their few “Elite” installers speaks for itself. We proudly represent Diamatic and the Ultraflor concrete polishing system to national accounts across the U.S.
Dynaguard has successfully completed projects in shopping malls, department stores, high-rise buildings, helicopter pads, hospitals, schools, manufacturing facilities, military installations, airports, and a variety of additional types of buildings. All processes are environmentally safe! Dynaguard carries a CSLB License Number 613535, with several classifications inlcuding General Bldg. Contractor, Construction Clean-up, and Concrete Related Services. We carry General Liability, Commercial Auto, Property and Workers’ Compensation Insurance. 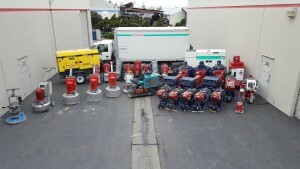 Dynaguard maintains a large fleet of equipment to meet the needs of any flooring job large or small. All aspects of our installations are performed in house from demo and prep to the finished product.